Protect your stock and avoid unforeseen closure with The Alarming Company. Is your stock flying out of the door? If it is, hopefully it’s for all the right reasons. If not, maybe you need to talk to us about CCTV and loss prevention. What use is CCTV if you can’t make out the picture? Install a modern system that provides a full-colour, high-definition image. Today, the retail industry is tougher than ever. Lost stock and unforeseen closure can eat into already thin margins. With regular hours, shops make easy targets at night, and when open, stock shrinkage accounts for one million thefts in the UK every year. Having an effective security strategy is therefore vital. We can help you develop this strategy, protecting your business from burglary, shoplifting and other risks. Getting your security right deters would-be thieves, protects customers and staff alike and keeps your margins intact, giving you the fighting chance you need. Property crime is expensive and can be extremely disruptive to your operations. Selecting the right intruder system ensures you have the right protection against the right threats. A quality CCTV installation means that you can see all areas of your shop in high definition, record, and view from anywhere in the world. 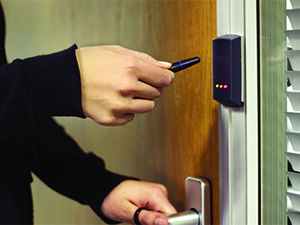 Effective access control to your back of house areas ensures that your staff can move quickly to and from the floor. And with intelligent access control, you can tell precisely who went where and when. No matter how good your planning is, sometimes, unexpected things happen. A burglary that has shown a weakness, a spate of crime in the area can all lead to you needing to move quickly. Similarly, large events may mean that you need additional security measures for short periods. Why choose The Alarming Company? Low cost and effective security for retail. Visible and effective deterrence against burglary and theft. Reduced cost of business insurance. 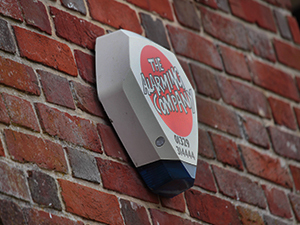 Quality installations to reduce the risk of false alarms. Wire-free systems reduce costs and disruption and allow for expansion. We won’t blind you with jargon or sales talk. Fully accredited for quality and statutory compliance.